The research themes of my PhD thesis  were related to those of the IMMED project . This 3 years project was founded by the French National Research Agency (ANR) with the identifier ANR-09-BLAN-0165-01. The acronym IMMED stands for “Indexing MultiMEdia data from wearable sensors for diagnostics and treatment of Dementia” (or “Indexation de données MultiMédia Embarquées pour le diagnostic et le suivi des traitements des Démences” in French). This project was initiated on the analysis that the aging population implies a major public health problem: maintaining elderly at home. However, aging is accompanied by an increased prevalence of Alzheimer’s disease and related sources of loss of autonomy. Detecting problems in an everyday life, in the so-called instrumental activities of elderly, at home could be a way to avoid any accidents and costly hospitalizations in terms of psychological and physical safety (to the patient and his family) as well as economically. So far, the daily capacity assessment was based on questionnaires completed by the patient or relatives. Thanks to a wearable camera, attached to the shoulder of patients, the space where instrumental activities occur is recorded. The Activities of Daily Living recorded at home are evaluated a posteriori by a medical practitioner. Thanks to the video indexing processing and the visualization software, the specialist can easily access the key moments of this recording. This observation is a way around the forgetfulness and denial, classical phenomena in dementia and allows reducing the delay in diagnosis or risk-taking at home (medicine management, falls etc…). 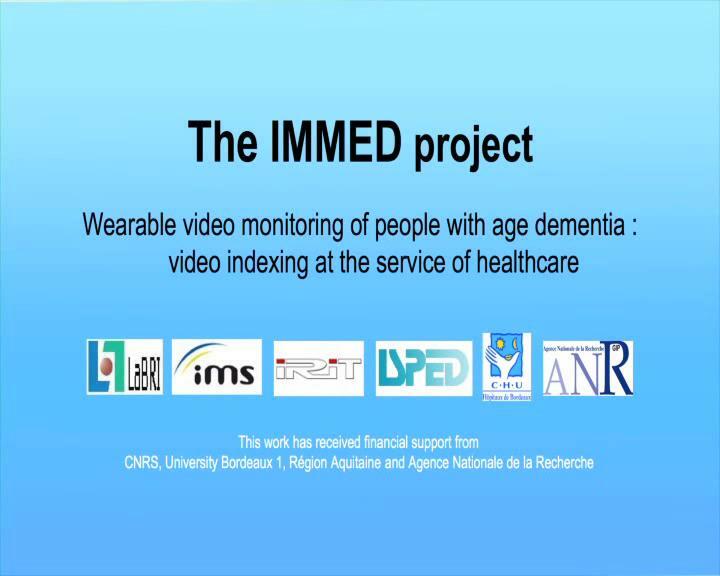 Within the IMMED project, I have developed tools and methods for indexing activities of daily living in videos acquired from wearable cameras, applied in the context of dementia diagnosis by doctors. The project partners have designed a lightweight wearable device which records patient activities in their own house, thus allowing the medical specialist to spot meaningful events. The recording mode poses great challenges since the video data consists in a single sequence shot where strong motion and sharp lighting changes often appear. Because of the length of the recordings, tools for an efficient navigation in terms of activities of interest are crucial. The work conducted during my PhD introduces a video structuring approach that combines automatic motion based segmentation of the video  and activity recognition by a hierarchical two-level Hidden Markov Model . We have leveraged a multi-modal description space  over visual and audio features, including mid-level features such as motion, location, speech and noise detections, producing cross-modal algorithms for the automatic indexing of daily living activities . These tools have been included in a video consultation software (developed under my supervision) used by the clinical partner, which exploited it to evaluate the effects of the disease on real data obtained from the recording of more than 50 recording sessions at home . This project has been referenced in MIT Technology Review and on French National Television. A European project « FP7 PI Dem@care », which was initiated by the IMMED consortium is now being in a continuity of this project. A synergy between project participants and the « LabEx Brain » for study of Parkinson disease has been established.